Maiko with umbrella. 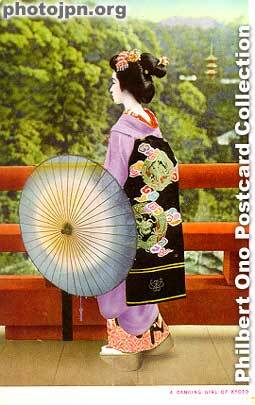 The quickest way to tell if she is a geisha or maiko is by looking at her back. The tell-tale sign of a maiko is her long obi sash hanging down behind. Whereas the geisha's sash has a short knot instead. Plus the inside is with red and white matterial. Geisha wear white inside.